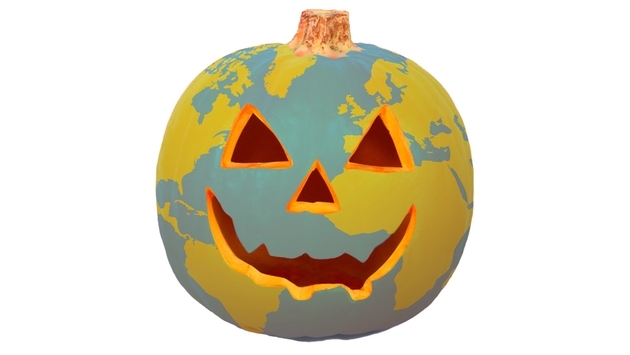 Halloween Traditions Around the World! Halloween is not a typical French holiday. It began to get popular in the 1990’s when young French hipsters started to have costume parties on October 31st. Bars and restaurants followed the new trend. Halloween is a fun way for French kids to learn English! Candy is a motivation to help kids practice, too! The 31st is usually during mid-season school break, so trick or treat outgoings are really organized. Even though some neighborhoods in France practice trick or treating, it hasn’t become a part of the French Tradition just yet. The word “trick” hasn’t become a tradition either so far. The French aren’t really motivated to egg houses, or clean toilet paper off their property. French kids don't necessarily understand that Halloween costumes don’t always have to be scary. You usually wouldn’t see any princesses or superheroes, there would mainly be zombies, ghosts, vampires, etc. Although French love costumes parties, they mainly hold them during New Year’s Eve, Birthdays, etc. Even the grownups join in on the fun. Despite the French celebrate bits and pieces of Halloween, it is still a foreign holiday. Usually, in the big cities there are celebrations, but in the smaller countrysides/cities there's aren't as many parties or trick-or-treaters. The kids especially enjoy participating, because it means free candy. Some kids even know the American tradition, and Catchphrase in English! Foreign Teachers in China have introduced the tradition of Halloween to many students and families, other than that Halloween isn’t well known. The concept of Halloween mainly entered China through foreign teachers and Western expats. Some foreign teachers might throw a Halloween party or teach a lesson on the holiday. In result, their students decorate their homes for October 31st and receive Halloween candy, but small amounts of Chinese don’t do much for it unless they have foreign friends who celebrate the holiday. In China, Halloween is a party day in “expat oriented bars” and restaurants, where a lot of “expats” live such as “Beijing, Shanghai, and Guangzhou.” Bars who serve foreign customers will often decorate for the holiday with black cats, ghosts, monsters, Halloween lanterns, etc., there might also be masquerade parties! Hong Kong’s two major theme parks Ocean Park and Disney Land have activities to celebrate October 31st, such as masquerades, haunted houses, movies, etc., but be careful people in costume might give you a fright! Italy celebrates a holiday called Carnevale, it is very similar to Halloween. Italy was introduced to Halloween from U.S. films, T.V., Pop Culture, and more! The tradition started off with the old-fashioned trick-or-treating part of the tradition. Halloween is starting to “throw some controversy over Italy’s All Satins and All Souls Day, on November 1st and 2nd respectively, and many worry about the fact that it may turn what is supposed to be a time to remember the dead with love and cherish, into yet another occasion to party” sited by Halloween In Italy. Germany has been celebrating Halloween for 25 years, although the phrase “Trick-or-Treat” angers the Germans! Many Germans are not happy with the growth of American Halloween in Germany, some areas decorate, sell costumes, have parties, and sell candy! Although Germany does not like the American Halloween way, they have a tradition of their own. The Movie Park Horror Fest has been going on for 20 years, including 2018, this is an annual event located north of Essen. They also have the Mayen Market “Festival Of Magic”, which includes a parade, pumpkin carving, costumes, and beer, this is all in the Eifel region. LEGOLAND has recently made its way into the tradition too. LEGOLAND became a Halloween event, where children dress up in costumes and receive free park admission. October 31st may be different in Germany, but it is still quite enjoyable! The United Kingdom celebrates Halloween practically the exact same way as America does. They throw parties where hosts and guests dress up, have pumpkins, spiders, and bats as their common symbols, similar to us. Although Halloween is not a public holiday, which means businesses have their regular work hours, that’s how it is in the U.S. too. People often gather for parties, horror movies, trick-or-treating, and many more activities. Houses that don’t pass candy out may also find a special little trick pulled on them! The origins of Halloween are in Pagan festivals in England, Scotland, Wales, and Ireland. Just like here many restaurants and businesses take advantage of Halloween to create cool holiday-themed treats and toys. The U.K. also believes that the end of October is when spirits of the dead come alive and walk around casually. The reason for costumes is they believe if they dress up as the dead then there will be no harm towards them. In Puritan times, Halloween was prohibited and outlawed, they eventually revised the law as time went on. Do you recognize the name “All Hallows Eve”, well if not that was Halloweens old name in the U.K, it was also known as “the day before All Saints Day”, and “Nut Crack Night”, “Thump The Door”, “Apple and Candy Night”, “Bob Apple Night”, “Duck Apple Night”, and many others. Many countries have similar Halloween traditions to America, but ours have a special meaning to it, that possibly only we would understand! It is interesting how different countries have different traditions for holidays. Girls rights around the world vary but one thing is clear, all countries need to improve. The countries this article is about are Sudan, the United Kingdom, India, Brazil, and Canada. Sudan, Sudan is a very bad country to be a girl because they have a huge child bride problem. Every year around 15 million girls under the age of 18 are married in Sudan. 12% of girls in Sudan marry before 15. Child marriage is a problem because usually, the girl does not continue her education and usually has a child at a young age. The risk for maternal death in Sudan is 1 in 31, for every 100,000 births their is 730 maternal deaths so many girls die at a young age. In Sudan girls can legally marry at age 10 with their parent's approval, child brides usually come from poverty and their parents see it as a way to get out of that life but they usually continue to stay in poverty. At school, many girls face violence and sexual harassment or assault. The United Kingdom, in the UK 10 incidents of sexual harassment or assault happen at school per day. This can affect the girl’s confidence and success in school. 22% of girls reported some sort of sexual assault or harassment at school but keep in mind a lot of these incidents go unreported. The worst place to be a girl is Middlesbrough while Waverly, Surrey is the best place to be a girl. Over half of girls think their peers struggle with positive body image because they feel so much pressure to look like the woman and girls they see in magazines. 20% of girls in the UK cited their bodies as their main source of worry. So while the UK is not as bad as Sudan they still have plenty of work to do. India, there are over 50 million girls missing in India. India is home to more than ⅓ of the worlds child brides. Like Sudan, India has a serious child bride problem as 6 million children are born to girls annually. This creates a circle of poverty because the child brides are already in poverty the child born to her will be poor and they will likely become a child bride to try and escape that life. Child marriage also kills a lot of girls because complications in childbirth and pregnancy are the number one cause of death for 15-19 year olds. Also just existing as a girl in India is dangerous because 7000 girls are killed before or after birth through abortions or infanticide. As you can see India is just as bad as Sudan. Brazil, In Brazil almost a third of Brazilian girls said they suffered from threats to beatings to attempted murder. This is alarming because if ⅓ of girls suffer from attempted murder think about how many have been murdered. Like a lot of developing countries, Brazil has a child bride problem as 36 % of girls are married before age 18. They also have a serious education problem especially for girls because 1.5 million girls are denied education. This is a problem because if girls aren’t educated they won’t be smart enough to get good jobs and get out of a life that they suffer constantly from. Brazil needs to work harder for girls rights because they still have no laws against sexual harassment at schools and in public places. Canada, When I began researching Canada I was surprised because I thought that they would have more positive than negative facts about girls rights but they still have a lot of work to do. In Canada 1 in 2 girls said that gender stereotypes often or always affect girls career path decisions this is problematic because if gender stereotypes are affecting girls career decisions this could permanently affect girls lives. Also, only 7% of girls said they feel their voice is valued. While lots of girls in Canada have access to school half of girls don’t feel safe at school. Girls in Canada also struggle with body image as 30% of girls said they struggle with positive body image. 39% of girls said they rarely or never feel safe from sexual harassment. So while the world may be moving in a positive direction on girls rights we all still have plenty of work to do.